Includes Strip/Chart Software and Drivers for C, Visual Basic, and TestPoint Optional LabVIEW Drivers are available. instruNet provides ten's of microvolts of absolute accuracy instead of ten's of millivolts, at the same cost and at the same throughput rates as typical general purpose data acquisition boards. It does this with a completely different topology where the analog electronics are close to the sensor in electrically quiet boxes outside your PC, and noisy digital electronics are left inside the computer. The external boxes contain signal conditioning amplifiers for each channel and can directly attach to sensors such as thermocouples, thermistors, RTDs, strain gages, resistance sources, current sources and voltage sources. The box returns engineering units to your PC (e.g. °C, Volts, Amps). At the heart of the real-time system is a PCI card (WIN XP/VISTA (32-bit)/7 (32-bit), PC-card (WIN XP/VISTA (32-bit)/7 (32-bit) or USB 2.0 (WIN XP SP2/VISTA 32-bit or 64-bit/7 32-bit or 64-bit) controller. Each controller contains a 32 bit microprocessor with 256KB of RAM that manages the external "network" of devices. All real-time tasks are off-loaded to this processor, therefore the host computer is not burdened with real-time issues. Each instruNet iNET-100 box provides, 16 single-ended/8 differential analog inputs, 8 analog outputs and 8 digital I/O lines. The iNET-100 includes 44 screw terminals. The iNET-100B version adds 16 BNCs for analog inputs. The controller's themselves provide 10 counter/timer channels each of which can function as a digital input bit, a digital output bit, a clock output channel or a period measurement input channel. The instruNet system is ideally suited for distributed measurement and control systems. The network cable can extend up to 1000 feet. Each controller card in the PC can connect to up to 16 instruNet boxes for a total number of 256 analog inputs, 128 analog outputs and 128 digital I/O. For additional inputs, multiple controller cards can be placed in one computer with the maximum number of controller cards limited only by the number of available slots in the computer. Since each controller card has its own microprocessor, multiple cards do not place any additional burden on the computer. It should be noted that multiple instruNet boxes on a single network may degrade the maximum system throughput of 166Ks/sec. The INET-100HC is similar to the INET-100, yet the voltage output channels have a higher drive capability, providing up to 15 mA of current to capacitive loads as high as 0.01µF. The INET-100 and INET-100B devices support only 4mA/.001µF voltage output drive. The INET-100HC is recommended for use with sensors that require excitation, such as strain gages, RTDs and thermistors since these sensors may exceed the current or capacitive drive limits of the INET-100 or INET-100B. The INET-100HC provides greater compatibility with sensors that have capacitive loading on the excitation lines, therefore, the HC version is recommended for all sensors requiring excitation including RTDs and thermistors. Since the HC version has a greater power demand, an external power supply must be used. The INET-312-8 can be used to power up to three INET-100HC boxes. instruNet World, is a FREE application program. It manages, monitors and operates the instruNet system. It digitizes long continuous waveforms, spools them to disk, views incoming waveforms in real-time and then allows post acquisition viewing-much like an oscilloscope or strip chart recorder. instruNet World provides a spreadsheet-like environment where one can set and view channel parameters such as sensor type, integration time, analog filter, and digital filter. Each channel has it's own row in the spreadsheet, with the various options in the columns. instruNet is also compatible with a variety of off-the-shelf software products including TEST Point; Microsoft Excel 8 for Windows, DasyLab and Labtech Notebook (consult the factory for the availability of DasyLab drivers). For users writing their own programs, instruNet includes drivers callable from any 32 bit C compiler, and Visual Basic (v4.0 or greater). The driver includes a main routine, called "iNet( )", that reads or writes any of the options or channels on the system. Optional drivers are also available for LabVIEW software. InstruNet World Plus Software is an option that adds valuable features to the standard instruNet World software which is included with instruNet hardware. 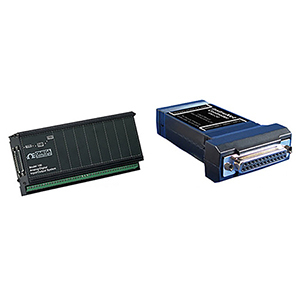 It enables one to digitize, plot, control, analyze, and save to disk A/D, D/A, and digital I/O data from InstruNet hardware. Additionally, it enables one to define their own instrument front panel with buttons, popup menus, edit fields, dynamic text, text editor regions, and waveform graphs. InstruNet World Plus is programmed with a simple script language that can define tasks such as control loops. For example, one can type "Dac1 = OnOff (Ain1, 3)" to define D/A #1 as a function of A/D #1. Gain and Offset Drift: ±5 ppm/°C of 5 V FSR; offset self calibrated to 0 Thermistor Accuracy/Ranges All OMEGA™ 44xxx series thermistors supported. (Contact factory for other thermistors.) One user supplied shunt resistor per thermistor channel is required. For additional information on InstruNet World Plus software see the "Related Links" section below. instruNet World Plus Software. Data acquisition and control software for the instruNet systems. See the Related Links section below for addtional details on instruNet World Plus software. 참고: The iNET-2xx controllers include a complete user’s manual, instruNet World data acquisition software, driver software and network terminator. The iNET-100/100B includes a 10 ft. connecting cable.